The final “Our Town” concept master plans and priority actions for the townships of Tin Can Bay and Cooloola Cove are under progressive implementation. Following extensive public consultation, the focus of the work Council is planning in Tin Can Bay and Cooloola Cove will centre on streetscape improvements including landscape design, improvements for pedestrian access and strengthening tourism attributes. 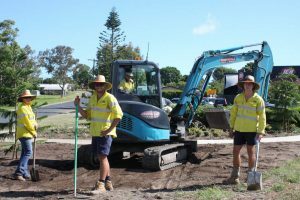 Tin Can Bay will benefit from an improved public realm within the local centre and community precinct, and Cooloola Cove hub will benefit from the investigation and delivery of a pedestrian linkage from the local centre to surrounding residential areas. The team were currently working on plantings near the Tin Can Bay IGA, including beautiful pines. She pointed to the new path, “They are widening all the paths at the foreshore as well. Once it is all finished, it will be wonderful for the community – especially our older residents. New footpath connection along Investigator Avenue starting at intersection with Nautilus Drive to connect with existing footpath, Nautilus Drive footpath linkage. 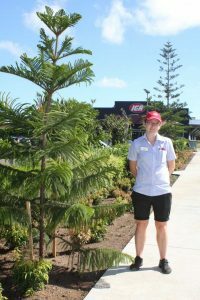 Street tree plantings to Tin Can Bay Road / Kidd Straight / Gympie Road for extent of local centre and community precinct.